Riley was a wonderful pet, a beautiful show dog, a patient Juniors dog and a very successful producer. 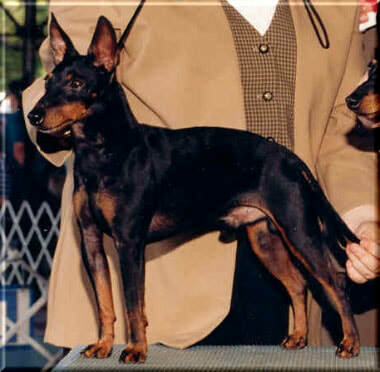 His influence on the breed is undeniable as he is behind many of the top-winning dogs of today. We remain eternally grateful to Rod Herner (Renreh Toy Manchesters) for his friendship and for allowing Riley to come home with our family. He was and remains dearly loved.